Obituary for Elizabeth B. (Morvai) Fanelli | Clawson Funeral & Cremation Center, Inc.
Elizabeth B. 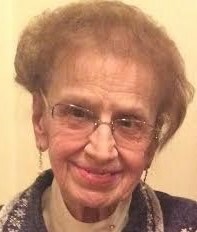 (Morvai) Fanelli, 82, of Leechburg, PA, passed away on Sunday, January 20, 2019, in her residence. A daughter of the late Arpad Morvai and Julia (Kaszonyi) Morvai, she was born October 17, 1936, in Leechburg, PA.
Elizabeth graduated as Salutatorian of the Leechburg Area High School Class of 1954, and then she attended Pennsylvania State University. Her career included working as a sales associate for the Joseph Horne Company in Natrona Heights, as a bookkeeper for Crookshanks, and in accounting for Walker’s Tax Service, both in Leechburg, and in the Accounting Dept. for Mellon Bank in Pittsburgh, from which she retired. Elizabeth was a member of the Cross Roads Community Presbyterian Church in Leechburg for over 50 years, where she served on the Deacon Board. She was an active member of the Republican Party having worked the voting polls during elections. As a volunteer at Allegheny Valley Hospital, she was a participant in the Soroptimist Society and Hospital Auxiliary. Elizabeth enjoyed bowling, reading and playing cards. Survivors include her daughter, Lisa Jo Fanelli-Greer of Grantham, PA; a granddaughter, Hannah Grace Greer; a sister, Helen Balla of Leechburg; and numerous nieces and nephews. In addition to her parents, she was preceded in death by her husband, Joseph Fanelli on September 20, 1995; two brothers, Arthur Morvai and Louis Balla; two sisters, Julia Balla and Ella Balla. Friends welcomed by her family on Sunday, January 27, 2019 from 2-4 and 6-8 PM at Clawson Funeral & Cremation Center, 170 Main Street, Leechburg (724-842-1051). Funeral ceremonies will be held at 11 AM on Monday, Jan. 28, at Cross Roads Community Presbyterian Church, 271 Main St., Leechburg, with the Rev. Gary J. Lyon officiating. Interment following at Evergreen Cemetery, 620 Evergreen Rd., Gilpin Twp.